Off the Page is a regular interview series produced by the National Magazine Awards Foundation. Today we chat with Jennifer Morse, general manager of Legion Magazine, winner of the National Magazine Awards for Investigative Reporting and Service: Health & Family at this past year’s gala. NMAF: Tell us a bit about Legion and its readers. Jennifer: Legion is an independent magazine and one of Canada’s oldest continuously published magazines, founded in 1926. Our mandate is straightforward: Bring the stories of Canada to as many Canadians as we can, with a focus on Canadian military history and issues facing members of the military, veterans, their families and communities. We blend a mix of stories—often by some of Canada’s top historians—with iconic images, using words and pictures to excite Canadians about their history. We’re not a magazine that is focused just on profit. We have a small, dedicated staff and a budget—like many magazines—that is limited. But we’re passionate. We have a readership, including print and online audiences, of more than 640,000, which is wonderful. Our readers really trust us to deliver quality journalism. NMAF: Earlier this year, Legion Magazine’s commitment to excellent journalism was recognized with two Gold National Magazine Awards: one in Service: Health & Family (“Lest We Forget,” which is about veterans struggling with PTSD) and the other in Investigative Reporting (“One Martyr Down,” the incredible story of the death of a Canadian soldier serving with UN Peacekeepers in Lebanon during the Israel-Hezbollah war of 2006). How do these stories exemplify Legion’s publishing mandate, and what kinds of responses have you received from readers about these stories and/or the awards? Jennifer: There has been an overwhelming response. In the last couple of years we’ve made a commitment to publish more longform journalism, which is difficult for publishers; obviously it’s more expensive. But these stories really exemplify our mandate and we want to pursue them no matter how difficult or how limited the resources are. On those stories in particular we received a great deal of feedback from a cross-section of readers, both military and civilian—lots of letters and comments on Twitter and social media, and it’s great to get that kind of participation. People feel like it’s their story, too. There are a lot of challenges facing Canada’s veterans and a lot of debate about benefits for veterans. Sharon [Adams] really got to the heart of this in the PTSD story and another one [“Collateral Damage: Families in the Wake of War,” which won Honourable Mention at the National Magazine Awards]. These stories have been talked about in Parliament and the Senate; they are stories that may help lead to change. The recent announcement [that the government will commit $200 million to military mental-health care and benefits] I think had a lot to do with Legion’s work. When we won the National Magazine Awards, lots of people—readers—contacted us to congratulate our writers and the magazine. These were the first two National Magazine Awards we’d ever won, and it was great for morale in the office. We already knew these stories were important to tell, and the awards and response put a stamp on it. I think readers felt like it was partly their award, too. We were very delighted. NMAF: Is there a measurable impact that winning a National Magazine Award has on the business of Legion Magazine, and where do you see this? Jennifer: I read a statistic recently about how magazine newsstand sales are soft, down 23% combined in 2012 and 2013. We all know there are challenges out there for publishers. We’ve fortunately had the opposite result over the last two years in that we’ve experienced growth in both direct circulation and advertising. It’s not always easy for a special-interest magazine such as Legion to succeed on the newsstand. Our special “Normandy” issue was on newsstands when the National Magazine Awards were announced, when we received a lot of news and feedback. And that issue has become one of our best sellers, the top one or two issues of all time. We are also seeing a pick-up in subscriptions via newsstand copies, and we’re forecasting a 14% increase in the second half of this year. Is it related to the awards we won—let’s hope so, but I think absolutely there has been a great impact, and we are thrilled. NMAF: This time of year is especially significant to Canadian veterans, with Remembrance Day and the WWI anniversary, not to mention the recent attacks on members of the armed services in Ottawa and Quebec. What is Legion presenting to its readers right now? We want to put these stories in context, to present the facts for our readers, because they are important stories to Canadians. And in a future issue we’ll be covering more of the story about the attack on Parliament Hill. NMAF: Who should be reading Legion magazine that isn’t right now? Jennifer: Every single Canadian! A reader recently told me he bought the special Normandy issue for his 90-year-old father, a veteran of the Second World War, who said he found it so satisfying to read something truly about Canada. We’re a country with our own story. I think Legion should be read in classrooms, in senior centres, and anywhere people want to discuss what we’re doing as a country, whether we’re doing it wrong or right. We know there is an appetite for stories like Legion presents, and our readers love the discoveries they make. Legion Magazine is published six times per year in English with a French insert. 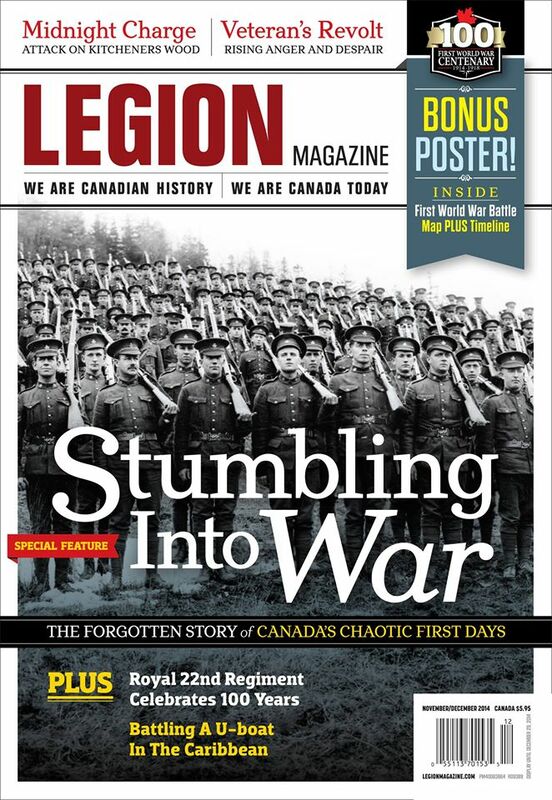 In addition to its two National Magazine Awards, Legion also won a Silver Award in Audience Development in 2014 from the Circulation Management Association of Canada for its “Victoria Cross” special issue. Find out more at legionmagazine.com and on Twitter @Legion_Magazine. Check out Legion’s holiday subscription offer for a chance to win a free Apple iPad Air. The January/February 2015 cover of Legion. Read more Off the Page interviews with National Magazine Award winners. The 2014 National Magazine Awards are now open for submissions. Early-bird deadline: January 11.